ABEL Interdisciplinary Research and Extension Activity Cell, PG & Research Department of Mathematics, Nehru Memorial College, Puthanampatti organized "One Day Workshop on GST" on 6 February 2018. The objective of the Workshop is to give awareness about GST. Dr. A. R. Ponperiasamy, Principal, Nehru Memorial College, Puthanampatti, presided over the function. 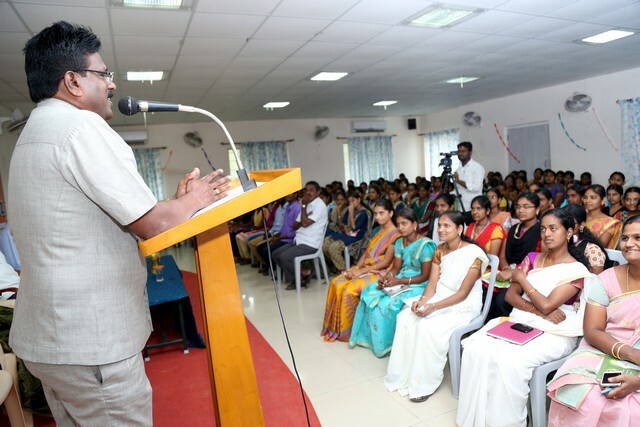 Dr. V. Saavithri, Head of the Department, Department of Mathematics delivered the welcome address. The first session was handled by CA.R. SELVAM, B. Sc., FCA Charted Accountant, N. Rajaraman Associates, Pondicherry and he delivered a lecture on overview on GST. The second session was handled by CA.V. MEENAKSHI SUNDAR, B. Com., FCA, Charted Accountant, Vaidyanathan and Co., Pondicherry and CA. K. KUMARAGURU, B.Sc., FCA, Charted Accountant, N. Rajaraman & Associates, Cuddalore (Alumnus of Department of Mathematics, NMC). They gave a detailed description about the law and practice of GST. Dr. T. Jayaprakasam, Former Principle felicitated the gathering. About 200 students of B.Sc. Mathematics and B. A. Economics participated in the workshop. Dr. V. Mohana Selvi,, Assistant Professor, proposed the Vote of thanks.